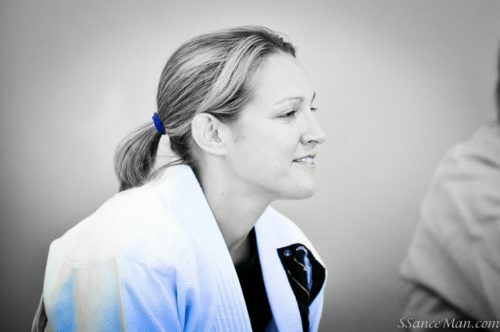 Nowadays there are many women and girls who are well known in the jiu jitsu industry. Women compete, they own their own academies, they are sponsored, they teach classes, they make a living doing jiu jitsu, etc. If you study jiu jitsu, you will see plenty of women in the lime light. But what about the ones who are hanging out in the background? 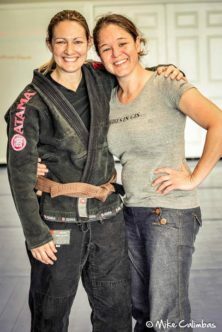 What were all of the jiu jitsu women who are now brown and black belts doing eight to 10 years ago? Let me introduce you to Ashley Nguyen. Nguyen is a wife, a mama to Mackenzie (2 yrs) and Lexi (4 yrs), a jiu jitsu student, a teacher, a pharmacist. . . and the founder of Girls in Gis. Most of us are familiar with Girls in Gis, because, let’s face it, you are reading their blog right now! Girls in Gis is an organization that helps grow and strengthen the jiu jitsu community by empowering and uniting females. Nguyen is a brown belt and her husband (Hai Nguyen) owns elite MMA in Houston. Back when Nguyen first started training, there weren’t many girls who trained. Nguyen wanted women to get the same thing she saw the men getting out of jiu jitsu. “The guys had this social aspect of training that wasn’t there for women,” she said. Nguyen founded Girls in Gis in 2009. She was in a self expression and leadership program, where she actually created Girls in Gis as her project. “I wanted friendship and camaraderie,” so that is how Nguyen came up with the idea of Girls in Gis. And what she wanted is exactly what happened through Girls in Gis. Nguyen, who is a pharmacist, used to own her own pharmacy and she taught leadership programs. About a year after Girls in Gis was created, Nguyen was just too busy to put so much time in to what the program needed. “People wanted to help make Girls in Gis bigger and it was a great idea,” she said. So she handed the program over to Shama Ko. And the program has grown from 15 girls at the first event to having 60-100 girls (even 187) at most events. Girls in Gis has spread beyond Texas and events are held in Colorado, Oklahoma, Kansas, Arizona, Nevada, Florida, Louisiana, New York, Massachusetts, Washington D.C, Washington, Oregon, Illinois, California, Georgia, Ohio and Hawaii. Often, people speak to Nguyen about this great program called Girls in Gis, not knowing that she started the program, and she finds it funny, humbling and amazing to hear. “Jiu jitsu is a common language that you (practitioners) speak that others don’t,” stated Nguyen. And because so many women are involved in the sport, if Nguyen travels she can find a jiu jitsu friend in nearly any city.